Roy Moore's Senate Campaign Claims Federal Income Forms Filed By His Hate Group Have Been "Fabricated" - Joe.My.God. Roy Moore’s US Senate campaign is now claiming that the income forms filed by his hate group are either fraudulent or “fabricated.” Seriously. 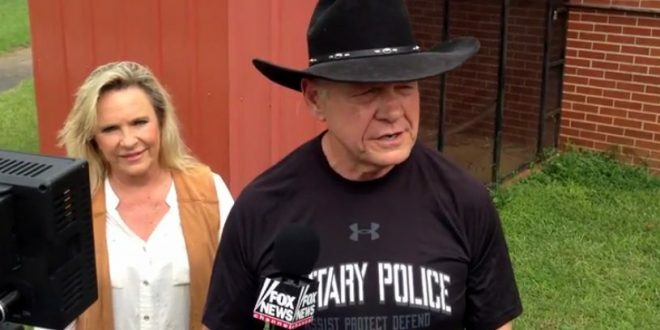 The 2014 form filed by the Foundation for Moral Law (FML) says the Alabama conservative ex-chief justice’s wife, Kayla Moore, did not receive compensation from the group despite serving as its president. That is contradicted by a separate filing Roy Moore made to the Alabama Ethics Commission last year, in which he said that his wife earned $65,000 from FML. The discrepancy over Kayla Moore’s income listings is just one of several questionable disclosures made by the Moores and their nonprofit group that were flagged in a review of forms by The Daily Beast last week. The Foundation For Moral Law advocates for instilling “biblical law” in the federal government. Their primary actions since being founded by Moore in 2002 are filing amicus briefs in LGBT civil rights cases and pleading for donations.